Headlamp taillight dx for smart cabrio city coupe 2002- orange. This product page has been automatically translated. If you have any questions, do not hesitate to contact us. The right rear tail light lamp for the smart city coupe cabrio 2002 to orange. Light rear right rear light (passenger side) for the city coupe smart cabrio 2002 to orange new product. For assembly, always contact a qualified technician. The photo of the list is indicative of the product sold. If this is stipulated that choose the right or left side, refer to what is written in the description. For items in which it is possible to choose between the right or left side, there is the customer, that the image of the advertisement is only indicative of the type of product sold and then choosing the side you need to take into consideration what is written in the title of the list. We use different courier, delivery times are estimated at 24/48 hours (except holidays) and up to 72 hours for remote areas and sardinia. The treatment time is estimated at 1/2 days. The risk mail to overtake without warning and after 2 delivery attempts, will be open storage report with the fees that will be charged to the customer and paid in return by the same. All orders placed before 16:00, will be shipped the next business day, so you get the goods 24/48 hours of work, excluding islands. We inform our clientele that it is essential to check the integrity of the equipment after delivery and inform us within 48 hours or less of any abnormalities. Exceeded this delay is no longer what carries the remuneration practices. If the outer packaging is damaged upon delivery is also fundamental make the bellman's remark on the delivery slip, writing sturdiness of the packaging are subject to control. We remind our customers that we are always available to solve any type of problem. If checks in 4 for us it negative! With positive feedback and 5-star rating will allow our company to stay in the market and provide users with more confidence and better services. The parts we sell (unless otherwise stated) are all competing products (or equivalent) identical to the originals. These are lasie products and import is, all certified and perfectly adaptable to the target car that reflect all the mechanical, electrical and aesthetic characteristics. Processed parts are all new, we do not deal with used material. We do not manage products that are already painted. Please always check the compatibility of the parts with your car and contact us for any question. Privacy Notice: With respect to the provisions of d. 196/2003: we remember each client that their information is collected and used for the execution of Nova Scotia. Analysis, consulting, support and information services and will not be disclosed. Each recipient can at any time, the information on the origin and content of your data and can request the integration, correction, update, etc .. the data controller is: costauto francis de constantin-via rubinacci, 19-80040 cercola (na) p.
Costauto francis of constantin-via rubinacci, 19-80040 cercola (na) -p. See contact seller number below (no call). The item "headlamp taillight dx for smart cabrio city coupe 2002- orange" is for sale since Sunday, March 18, 2018. 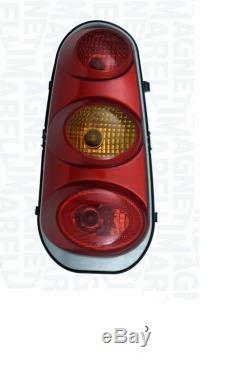 It is in category "auto, motorcycle parts, accessories \ auto \ parts \ optical, lights, turn signals \ rear lights, braking ". The seller is "costauto80" and is located in / in boccia al mauro. This item can be delivered anywhere in the world.